Coughing is a condition commonly experienced by the Little One. This is caused by the immune system that has not been fully formed that makes your Little One is more susceptible to various infections. Cough is actually not a disease, but a symptom that protects the body. Naturally, our body responds to foreign bodies in the lungs (such as phlegm or dust) by coughing. This is so that the foreign object comes out and does not clog the respiratory tract. Although in most cases that occur, cough can heal itself but that does not mean that you can underestimate the symptoms. What to do when your Little One coughs? Reduce the activity of the Little One, let him/her rest a lot first. Warm fluid intake can also help dilute the phlegm that attaches to the respiratory tract. This is important for the healing process. In addition, fulfill your Little One’s nutritional needs by providing a variety of foods, especially nutrients that contain lactoferrin so that the body's immune system increases. Nucleotides are proteins that the body needs to be able to strengthen immunity towards infections and support the health of the digestive system. Nutrition will be absorbed and channeled properly if the digestion of the Little One is healthy. Nucleotides also play an important role in the formation of the metabolism of the Little One. Lactoferrin is a type of protein that binds to iron. Various functions of lactoferrin include as an antimicrobial, a regulator of iron absorption in the intestine, and a regulator of the body's immune system. Lactoferrin works on white blood cells to provide immunity. With a maximum immune system, your Little One will not be infected more severely than viruses and bacteria in the respiratory tract. He/she will be prevented from experiencing cough, cold, and ARI (Acute Respiratory Infection). It is an important information to know so that doctors can predict the possible causes of coughing. Based on its duration, cough is divided into two types: acute (under 3 weeks) and chronic (over 3 weeks). Acute cough is caused by a viral infection of the upper and lower airways. Meanwhile, chronic cough can indicate a more serious health condition. What are the characteristics of the cough? Is there any phlegm or not? What is the color of sputum? Does the cough sound like barking? Characteristics of cough are important so doctors can predict the cause of coughing. Are there any cough triggering factors? Usually, cough on the Little One who has allergies or asthma is caused by a precipitating factor, such as dust, cold, certain foods, or animal hair. Avoid these precipitating factors so that symptoms of cough due to allergies do not recur. Cough is often followed by other symptoms, such as runny nose, pain when swallowing, fever, shortness of breath, and so on. The main cause of coughing can be determined by other symptoms that accompany it. Cough is most often caused by a germ infection that spreads easily. For this reason, you must teach your Little One to cover his/her mouth and nose using a disposable tissue or inner elbow when he/she coughs. Also make it a habit to use the mask when coughing. This will prevent transmission to family members or friends. The cause of coughing on your Little One is not just one. To find out, the doctor must conduct an interview and thorough examination. Treatment will be adjusted to the cause of cough. Mommy does not have to overreact to cough but also must not underestimate it. Do the steps above if your Little One coughs, to reduce the risk of more serious complications. Make sure that Mommy has the schedule for immunization of your Little One, so your Little One will not have a late immunization. Regulation of the Minister of Health no. 12 year 2017 explains that immunization shall be given according to the time specified in the implementation guidelines. 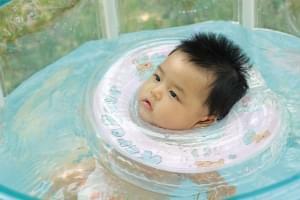 Baby Spa: A Necessity for the Little One or a Wish of the Parents? Nowadays spa facilities are not only designed for parents. The Little One can also enjoy these services at special service outlets that have recently emerged. How beneficial is baby spa? Is it just a mere trend?